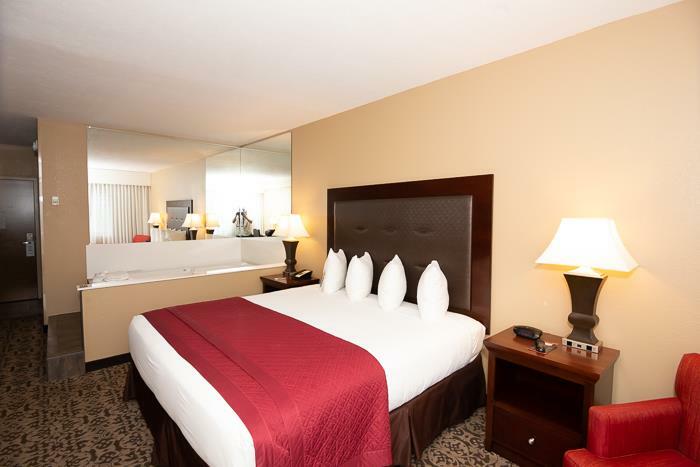 Conveniently located just minutes from the Tanger Outlets, Thousand Hills golfing and downtown Branson attractions, Grand Oaks Hotel offers comfortable accommodations that feature free Wi-Fi, cable TV, mini refrigerators, microwaves, and coffee makers. On-site amenities include complimentary daily breakfast, indoor and outdoor pools with a whirlpool spa, a sundeck and a fitness center. Less than a mile from shopping at Tanger Outlets and golfing at Thousand Hills. 2.8 miles from downtown Branson. Nice cozy sitting area next to fireplace in lobby. Stay connected with free Wi-Fi. All rooms have minifridges, microwaves and coffeemakers. Start your day with a complimentary hot breakfast. 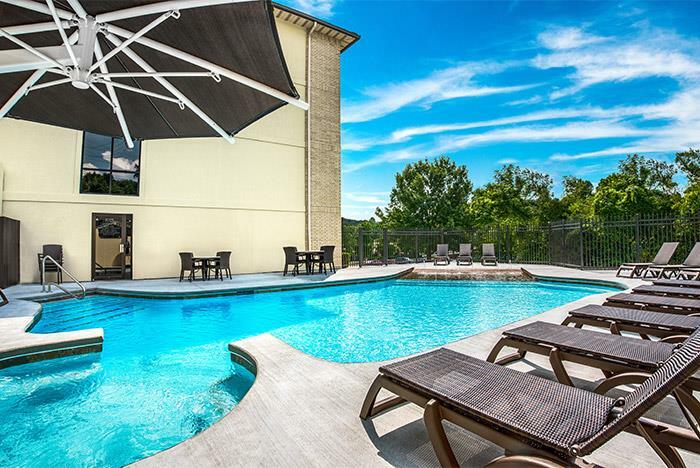 Splash around in the outdoor and indoor pool. 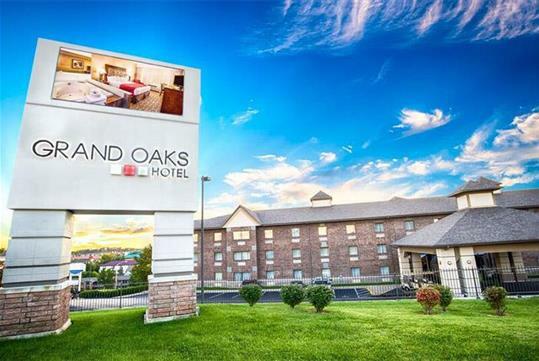 Among the most popular hotels and nestled in the heart of Branson is the Grand Oaks Hotel; a refreshing departure from the standard hotel room, with amenities and service associated with more upscale properties. 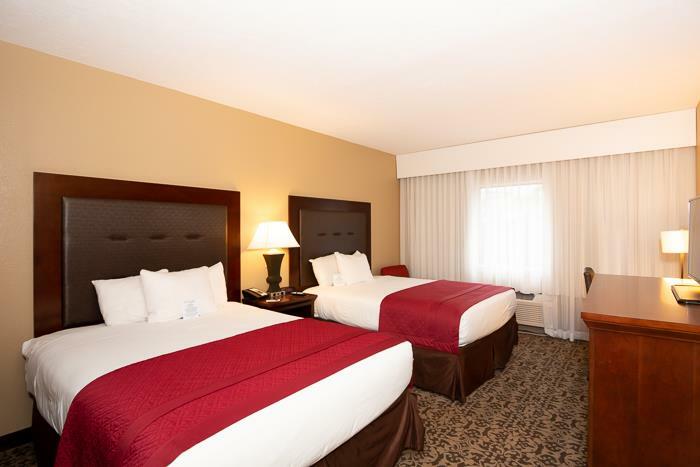 Relax in warmly appointed guest rooms on Serta Perfect Sleeper Beds while enjoying complimentary Wi-Fi, iron & board, hairdryer, cable TV, refrigerator, and microwave! 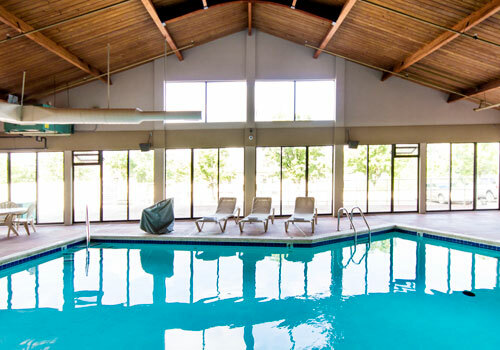 The Grand Oaks Hotel is also one of the select hotels in Branson to offer both indoor and outdoor pools. 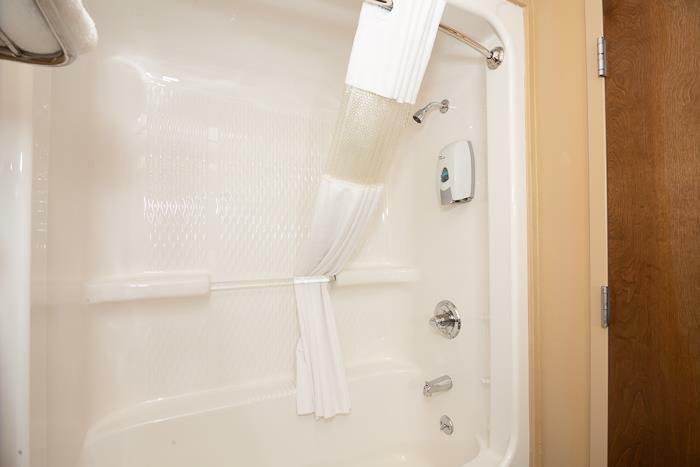 Relax in a hot tub following an invigorating workout in the fitness center or soak in private with a jetted whirlpool tub right in the room. Indoor corridors and new RFID locks on the doors help you to feel more secure while away from home. 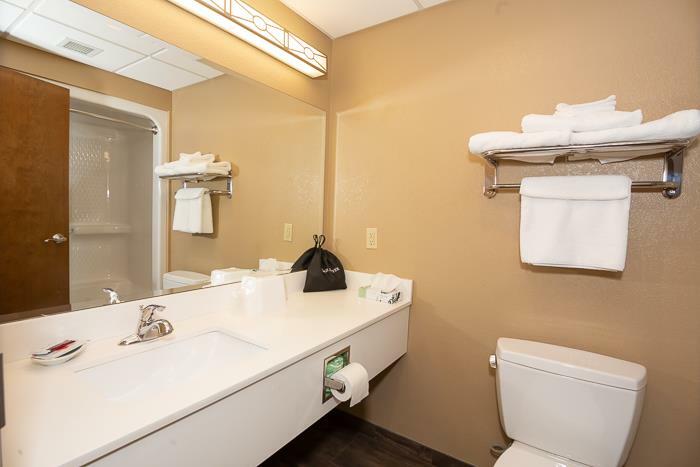 Branson’s Grand Oaks Hotel is a refreshing departure from the typical hotel room with a variety of accommodations to fit our guests' needs. 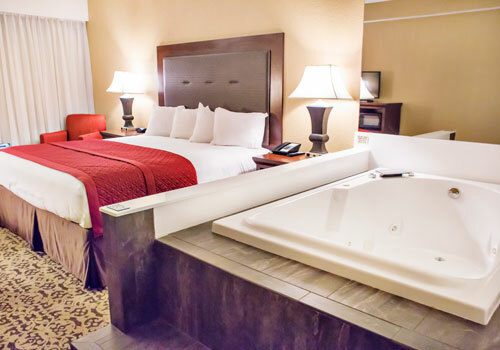 Our King Jacuzzi Suite is perfect for romantic getaways while our Queen Rooms are perfect for families. 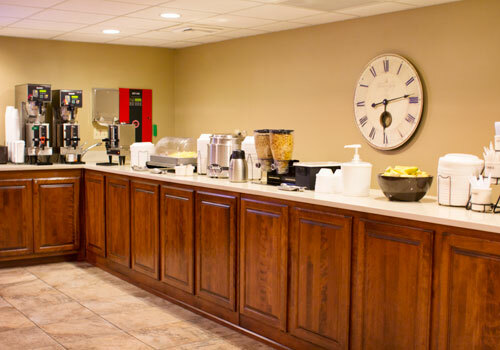 Guests will enjoy the complimentary hot breakfast served each morning of their stay with either biscuits and gravy or sausage and eggs served on a rotating basis along with fresh pancakes, cereals, yogurt, fruit, juice, breads, milk, and coffee served daily. 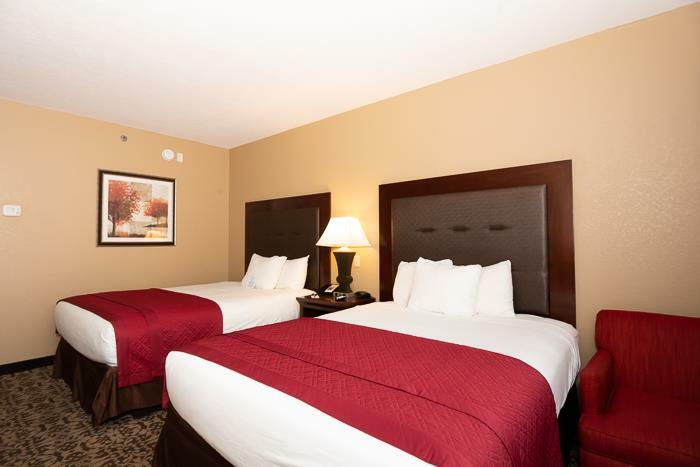 The Grand Oaks Hotel is minutes away from Branson’s most exciting attractions. 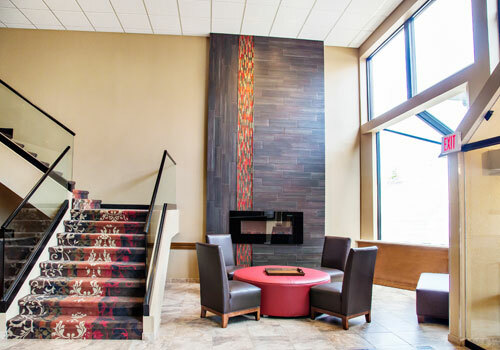 We are committed to meeting the needs of all who enter our doors with friendly, professional service and stylish guest accommodations that are warmly appointed. 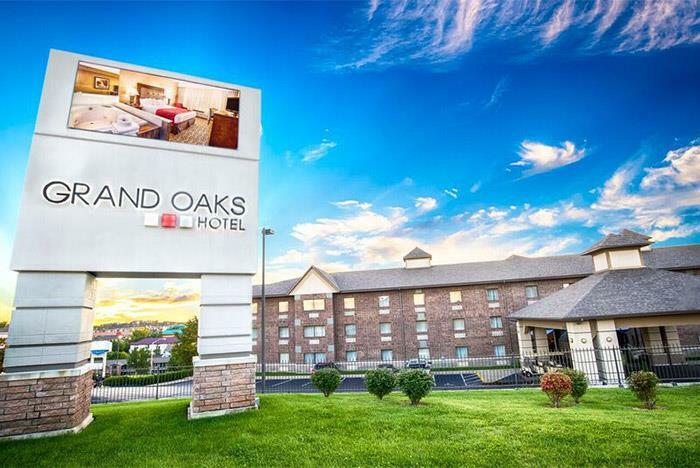 How many rooms are available at Grand Oaks Hotel? There are 201 rooms available at this property. Does the Grand Oaks Hotel offer adjoining rooms? 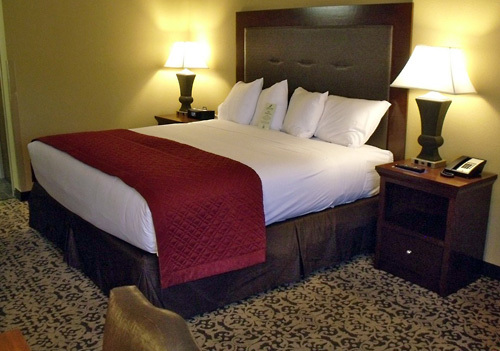 There are 14 sets of adjoining rooms available at the Grand Oaks Hotel. How many buildings comprise your units? There are two buildings at the Grand Oaks Hotel. How many floors constitute the buildings at Grand Oaks Hotel? The buildings have a total of four floors. 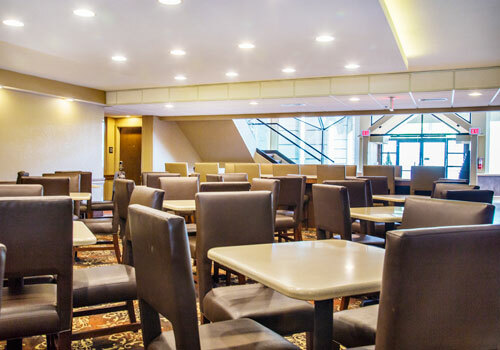 Do you have a restaurant on-site? A lounge? Café? Gift Shop? 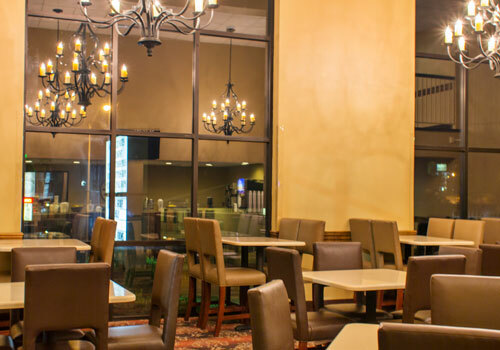 Do you have a minimum age required for check-in at Grand Oaks Hotel? Guests must be at least 21 years of age to check-in at this property. Are there any resort fees at Grand Oaks Hotel? There is no resort fee charged at this property. Do you charge for cribs, rollaways, microwaves or fridges at Grand Oaks Hotel? Cribs are $10 per day. Rollaways are not available but high-quality air mattresses are available in both buildings for a fee of $10 per day. Microwaves and fridges are provided in-room, free of charge. What are the pool hours at the Grand Oaks Hotel? The pool is open from 9:00 am-11:00 pm. 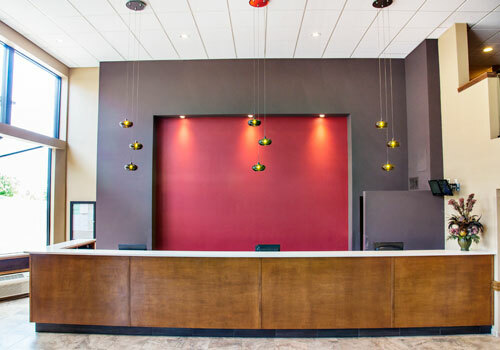 Is late check-in available at Grand Oaks Hotel? All reservations are guaranteed so the guest may check in at any time. Contact us for support or help booking your trip at 1-844-993-3237.